Engineered by divers, the TAG Heuer Aquaracer WAP2011.BA0830 is a certified professional water sports watch that can handle up to 300M of water. The TAG Heuer Aquaracer WAP2011.BA0830 timepiece collection, developed and designed by professional divers, is an essential companion not only to men but to divers as well. The Aquaracer Calibre 5 Automatic is a certified professional water sports watch— it resists water up to 300M and is equipped with a “superluminova dot” at 12 o’clock to illuminate the time even in the murkiest of waters. – A date window at 3 o’clock. – Dial horizontal texture that is available in black or silver. 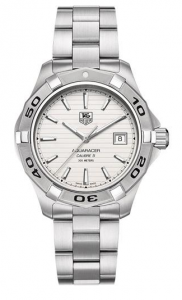 A few care instructions you should be aware of before purchasing your watch are that although the TAG Heuer Aquaracer WAP2011.BA0830 is waterproof, it should be checked annually to undergo pressure tests to ensure that its rubber seal is intact and protecting your watch from water entry. Cleaning it is relatively simple; all you need to keep it looking its best is soapy water and a soft brush to scrub away impurities, and a soft cloth to dry it. But too keep your watch in the best condition, take care to avoid all chemical products (including cosmetics) while wearing your watch. Another detail you should know about before buying this watch is that if temperatures change quickly a thin layer of condensation may form beneath the face of the watch. The mist will disappear by itself without harming the timepiece, however it can be bothersome. 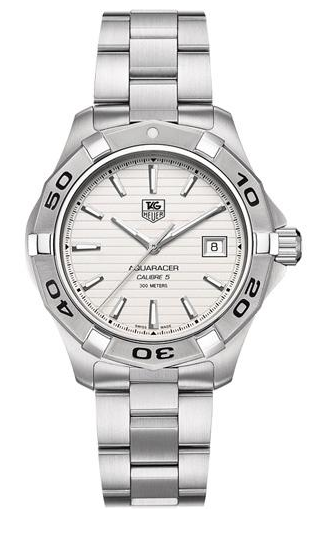 If you’re looking for a watch that can handle deeper depths of water there are other TAG Heuer Aquaracer timepieces that can resist water up to 500M, but if you’re just in the market for a watch that can accompany you on land or water, diver or not, the TAG Heuer Aquaracer WAP2011.BA0830 makes a great companion.